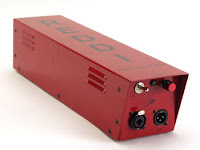 A-Designs Audio makes the REDDI, which is a tube powered DI that brings warmth, power and realism to your DI tracking. What's a DI? DI stands for direct injection. It's a method of recording whereby an an electric instrument gets plugged directly to your recording console, microphone preamp, or analog to digital converter. Supposedly, Paul McCartney first used the technique in 1967 on "Sgt. Pepper's Lonely Hearts Club Band." I've found that DI tracking can bring a better signal to certain types of tracking such as bass guitar. The REDDI weighs as much as any mic preamp in my studio. Yet, it's arguably the simplest device in the place as it only possesses one control labeled "level." Out of the box, I found the red paint job to be flawless with the rest of the REDDI to possess quality fit and finish. I found the IEC standard AC cord to be heftier than most and all the screws and seams lined up properly. I tracked tracked some bass lines from a 1962 Fender Reissue Precision loaded with EMG pickups. With the output knob low, the REDDI put out a deep and smooth tone. Using the same bass, I started experimenting with adjusting the level control. The sound changed from warm and smooth to agressive, a little growl, but no distortion. Halfway through the dial, the REDDI gave me a tone resembling a cherry sounding Ampeg B15. Next, I ran the output of a wonderful sounding Rhodes right onto the REDDI, I liked the results. I found the sounds rivaled those achieved by putting the Rhodes through a quality amp with the only missing element being the space one gets from mic'ing an amp. I experimented with 335 electric guitar copy plugged into an overdrive pedal into the REDDI. I found the tone to be warm, true and powerful without the noise one gets from a guitar amp. I tried a Fender Telecaster plugged into the REDDI. I put an MXR Dynacomp into the chain. An Albert Lee sort of tone emerged. I put the 335 clone back into action. I tracked through the 335's neck pickup and laid down some jazzy sounding tones - all accurate, all noiseless and all free from audio bleeds and loud drummers. I found the REDDI to be the most versatile and useful DI I've encountered. It solves a lot of tracking needs in my studio. It adds a new sonic dimension to anything you throw at it. I suggest giving the REDDI a try as a live bass DI. I’ve seen REDDIs in racks, on top of amps, and even in a few custom built pedalboards at shows. I also suggest using the REDDI with a dynamic mic on a snare drum. It's a choice for those of us who march to a different drummer who strive to put a unique set of guts onto a snare track. One thing to remember: Great recordings usually possess different sonic images on different tracks. Even with a top of the line DI such as the REDDI, you'll want to limit DI usage to a few tracks in most projects. The Bottom Line: I feel the REDDI should fall in the category of "must have." I admire it's versatility and quality of tone. It's bult like a tank. Highly recommended.